Should I Buy a Glass Teapot to Brew Tea? Guest post: Tea connoisseurs are absolutely crazy about teapots, teacups and any other tea paraphernalia they can get their hands on. I should know – I’ve got two cupboards full of tea sets I’ve barely used! Though I own upwards of ten teapots, the one that has me coming back to it time and again is a nifty little glass teapot in my kitchen. It’s attractive, easy to maintain and most importantly, makes great tea! Here’s a quick guide to glass teapots. I’m not overly fond of cast-iron teapots as the cheaper ones tend to leave a slightly metallic taste in lighter teas. Glass teapots are neutral – they don’t affect the taste of the tea at all so you can experience the authentic flavor of the tea in all its glory. Glass teapots are also very aesthetically impressive. If you’re into blooming flower teas like I am, a glass teapot is really the only way to go. Watching the flowers expand and unfurl in your glass teapot is a magical experience that you’ll miss out on with ceramic or cast-iron teapots. 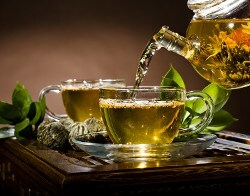 Moreover, clear glass teapots integrate seamlessly into any tea set, so you don’t have to worry about clashing prints. Finally, glass teapots offer good value for the money. Practically every glass teapot I’ve come across is sold with a strainer included, so you save money on a tea infuser. Moreover, glass is really durable. It rarely stains and it doesn’t react with air or degrade over time. So long as you don’t drop it, a glass teapot will last you for years. Check out the Glass Teapots on Amazon . It must be said that glass teapots are not quite as adept at absorbing and retaining heat as ceramic or cast-iron teapots. That means your tea might take a little longer than usual to brew. In addition, unlike cast-iron teapots, glass teapots don’t “remember” the last tea they brewed, so you won’t get layers of tea flavors building up over time. However, that might also be seen as an advantage since you can use a glass teapot for more than one kind of tea. If you use your cast-iron teapot for Pu-Erh tea, you’re pretty much stuck with Pu-Erh – any other kind of tea brewed in that teapot will have hints of Pu-Erh and taste a little weird. Glass teapots are really easy to maintain. Just wash them with a mild soap after use to keep them clean and stain-free. Remember never to put a boiling hot teapot under cold water or it may crack. If you’ve been thinking about buying a new teapot for your collection, I hope I’ve convinced you that a glass teapot is an ideal choice. Mine has served me well for half a decade and it’ll probably continue to do so for many years to come.